Author Natasha Lowe says she wrote "Lucy Castor Finds Her Sparkle" in her kitchen in Deerfield, Massachusetts. 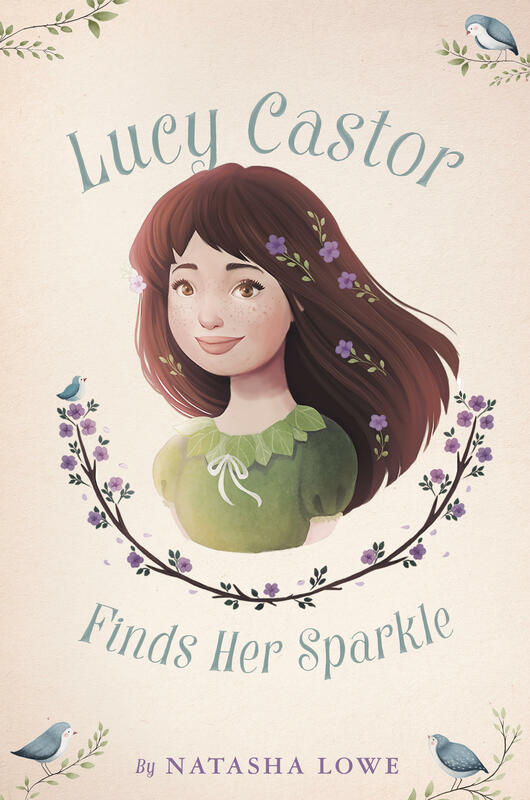 Cover art for the book "Lucy Castor Finds Her Sparkle" by Natasha Lowe. Illustrator David Costello, a friend of author Natasha Lowe's, made her a drawing of the gnome that Lucy Castor saw in the book "Lucy Castor Finds Her Sparkle." Lowe keeps the drawing on the wall in her Deerfield, Massachusetts, kitchen. A pair of canvas images from the cover art for the book "Lucy Castor Finds Her Sparkle," hang on the wall in author Natasha Lowe's kitchen. Our back-to-school book series continues with the story of nine-year-old Lucy Castor, who starts fourth grade at the beginning of the book, "Lucy Castor Finds Her Sparkle." Author Natasha Lowe, who lives with her family in Deerfield, Massachusetts, says that channeling her inner nine-year-old wasn't difficult. Natasha Lowe: I feel like I'm still probably nine years old inside in a lot of ways. I was lucky I had a great childhood. I had a childhood full of fun and magic and I think that stays with you. So, having four kids is great because I have been able to see them go to school, and what it’s like being a kid now. But the feelings, the emotions of childhood, are the same, whether you were a child many years ago or whether you're a child now. So no, my nine-year-old is right there with me all the time. Lucy and I share a lot in common, I think, out of all my characters. She's the one that I can sort of identify with most closely. I mean, she's her own person, but we share similar traits. Carrie Healy, NEPR: Is a part of what Lucy knows of magic in Natasha? Is that what you wrote into her? I was a big believer in magic. Lucy has this moment where she realizes that her best friend, Ella, who stops being her best friend, has given up believing in magic. And that's very difficult for Lucy, because she's not ready to give up believing in magic. So her whole world is sort of crumbling at that moment. And I was like that. I looked for magic everywhere, and in fact, the book opens with Lucy having this gnome standing there in her cupboard, and she shuts the door, and she runs down and says to her dad: "There's a gnome in my cupboard," and he comes right back up, and opens it. And that was based on something that happened to me. Now I should say for everyone listening: I've never seen a gnome since, or any other magical creature. But when that happens to you, and you have this very vivid imagination, at a young age, yes -- you go on believing in magic for a long time. And it's hard when you reach that, that moment when you realize, like, “Oh! People aren't believing anymore,” and this sense of feeling left behind. Right now is a great time to talk about Lucy. She was given some coping skills in dealing with these changes. It's the beginning of the year. Kids are starting school. Not to be a complete spoiler, but one really great skill that she was bestowed was using a book as a prop. How important is that? I think it's nice to have something that makes you feel comfortable when you start out in a new situation. And for Rachel, who is the girl who sort of befriends Lucy after she has this heartbreaking break-up with her best friend Ella, Rachel likes to have a book with her. And she's moved around to a lot of different schools. So making friends has been difficult for her. She's always up and going again. A book, in a way, is her friend; it's her constant, it's her companion. I love that about books in childhood. When times get rough, you can dive into a book and just revisit your favorite friends and characters over and over again, and they never go away. And they don't change, and that's the wonderful thing -- because change is hard, and at the start of a school year, you're going back, you've got new teachers, you've got new friends, new kids in your class, and this is an age of change. Friendships do change, and when you're nine years old, and you've had a best friend since kindergarten, like Lucy, that's pretty heartbreaking, and it's a big thing to deal with.